of an overarching, flowering dogwood tree. and His abiding gift of love." Image Size 25.5" x 34"
Add $30 for shipping & insurance. Add $45 for shipping & insurance. Subtract $75 for unframed canvas. Add $75 for shipping & insurance. Subtract $100 for unframed canvas. Image Size 30" x 40"
Add $95 for shipping & insurance. Subtract $125 for unframed canvas. Dogwood Chapel copyright© 2004 by Thomas Kinkade is prohibited from being copied. Web pages copyright© 1998-2011 by Christ-Centered Art. All Rights Reserved. 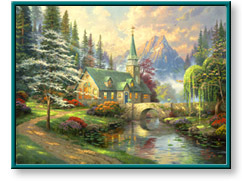 Thomas Kinkade art prints paintings canvases pictures images and artwork of Dogwood Chapel can be purchased at discount prices at Christ-Centered Art. Dogwood Chapel painting by artist Thomas Kinkade (also spelled Thom Kincade, Kincaid, or Kinkaid) can be purchased in art print or canvas form at special sale prices at Christ-Centered Art.